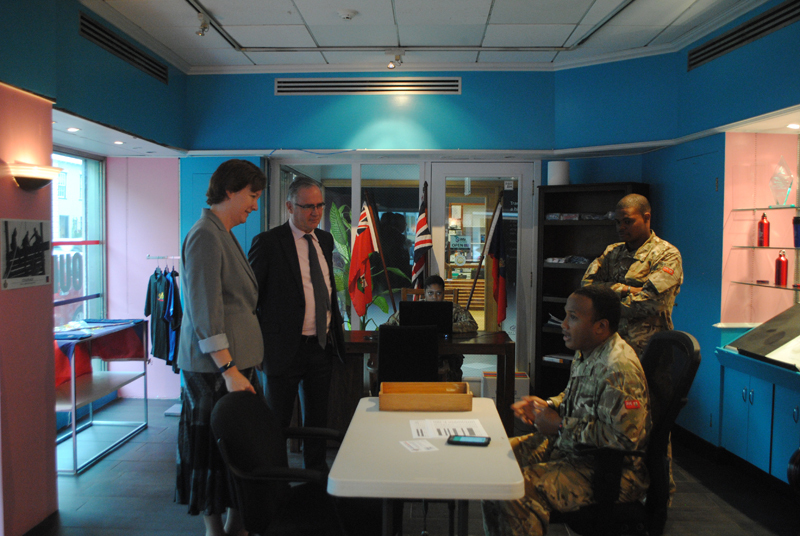 Governor John Rankin today paid a visit to the Royal Bermuda Regiment pop-up recruiting office in Hamilton. Mr Rankin toured the RBR shopfront and spoke to Commanding Officer Lieutenant Colonel David Curley as well as to soldiers manning the centre. The Governor said: “I’m delighted to see this further outreach from the Regiment to attract volunteers. Mr Rankin, accompanied by Deputy Governor Ginny Ferson, added: “I have heard myself from members of the Regiment how much they have learned and benefited from their service. [L to R] Deputy Governor Ginny Ferson and Governor John Rankin talk to Corporal Richard Zuill and Sergeant Curtis Grant at the RBR’s pop-up recruiting office in Hamilton. Ms Ferson said: “It’s a great idea to bring the Regiment to the people rather than waiting for them to go to Warwick Camp. The store – at the corner of Reid and Queen Streets in Hamilton and scheduled to stay open until the New Year – operates from 10am to 6pm Mondays to Saturdays and will be open until 10pm in the week before Christmas. Colonel Curley added that recruitment had gone as well as expected so far. 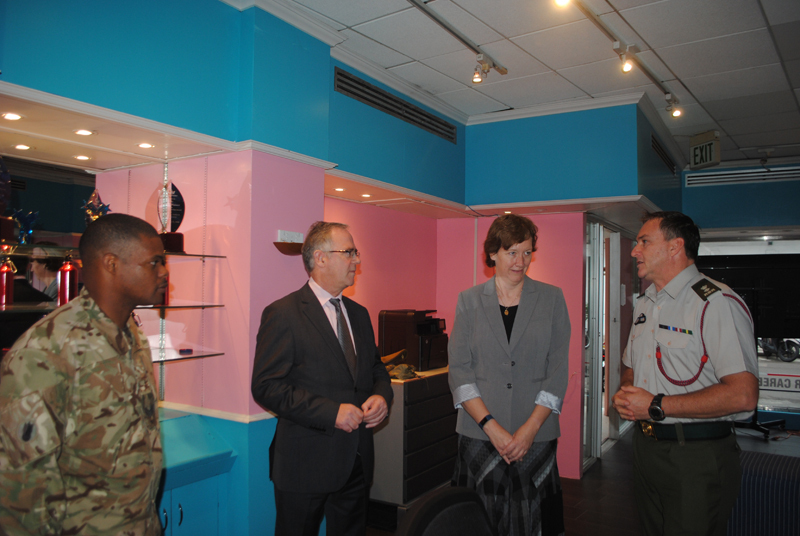 [L to R] Private Joliza Vanderpool and Sergeant Curtis Grant update Governor John Rankin and Deputy Governor Ginny Ferson on recruitment statistics at the RBR’s Hamilton recruitment office. A total of 25 former soldiers have also rejoined the colours and will not have to redo recruit camp, but will go straight into platoon positions. Colonel Curley said the RBR would hold a second recruit camp in July next year, as well as the traditional January intake. He explained: “That second camp will focus on young people who are leaving school and maybe not sure of what they want to do. Colonel Curley said: “We’ve done a lot of advertising and we think we’re getting the attention of the age groups we want to interest. 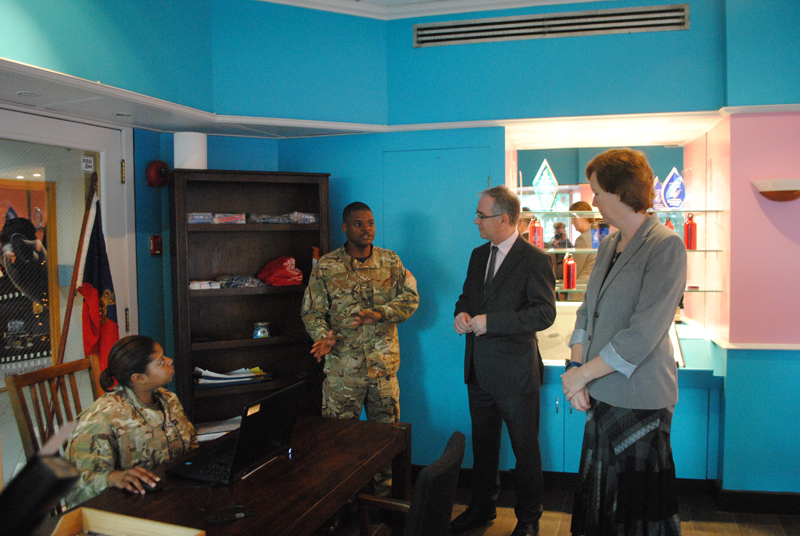 RBR Commanding Officer Lieutenant Colonel David Curley [right] explains the Regiment’s recruitment process to Governor John Rankin and Deputy Governor Ginny Ferson with the help of Sergeant Curtis Grant. “The main effort for the pop-up recruiting office is to introduce us to some of the people who are out and about in town, get them in the door and have them chat with our recruitment staff. Colonel Curley added: “It’s a relaxed atmosphere and pleasant inside – we want people to be comfortable and happy coming in to see us and hopefully they will sign up with us.